I am a theatre junkie. 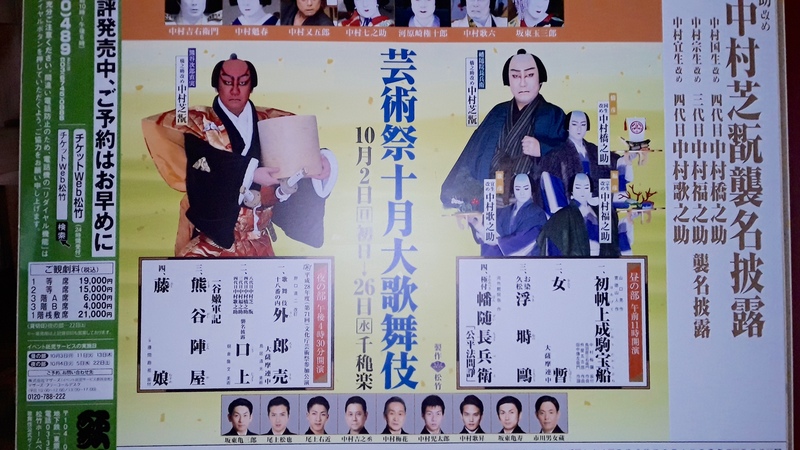 Kabuki is at least as old as Shakespeare. It’s one of THE drama traditions I heard about as soon as I decided theatre was my life. 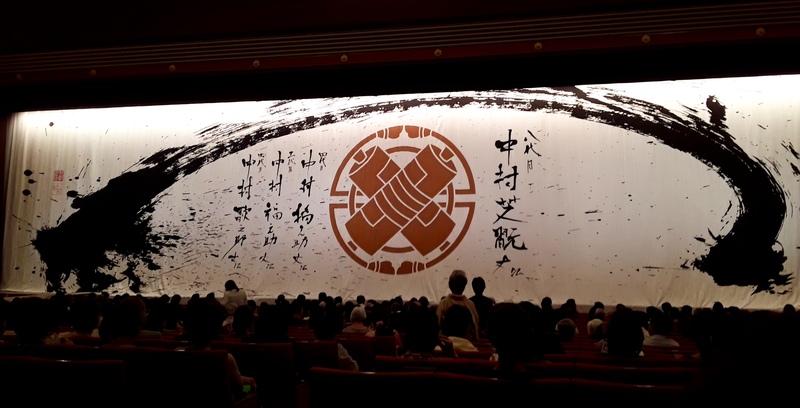 Going to a kabuki play was on my must-do list while I was in Tokyo, but it was also felt, for me, like going to a cathedral and I hadn’t been to confession. 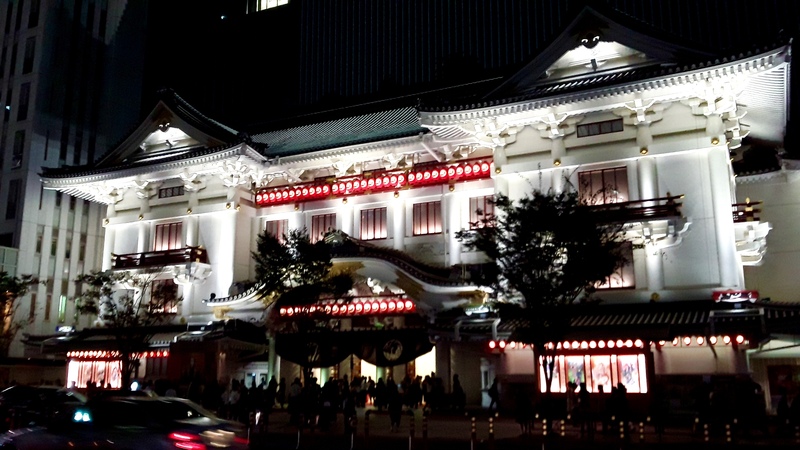 The Kabuki-za Theatre in Ginzu, Tokyo, the largest in Japan. Billboard for the show outside the theatre. Of course no photos were allowed during the show. It was utterly amazing. It was actually four short pieces I saw, which — with intervals when you could get full meals and beer to have at your seat! — was three and half hours long. The style of acting and the men playing women (I’ll need to post about that separately—because) took some getting used to, because it’s so utterly different from any show I’ve ever seen before, and that’s part of the reason it was enthralling. One of MANY screens hiding the stage over the performance. Everything I felt seeing my first kabuki was wrapped up in what I’d felt earlier that day while trying to track down Oiwa…the main character in one of Japan’s creepiest ghost stories, most famous kabuki plays (I didn’t see that one, sadly), and many of the country’s successful horror films. There are a few different versions of Oiwa’s story: here’s one of the shortest, yet best and scariest. Horror and/or Japanese film fans will recognise her likeness from the Ringu series. I have presumed to put her into one of my stories…the short film I started work on in France over the summer, and the related feature-length screenplay I just drafted. They both concern domestic violence, culture clashes, racism, sexism, revenge, and guilt. Theatre people are, put mildly, superstitious. We call it “The Scottish Play” or “McBoo”. We leave a “ghost light” on in the middle of the stage when the theatre is otherwise empty and dark. 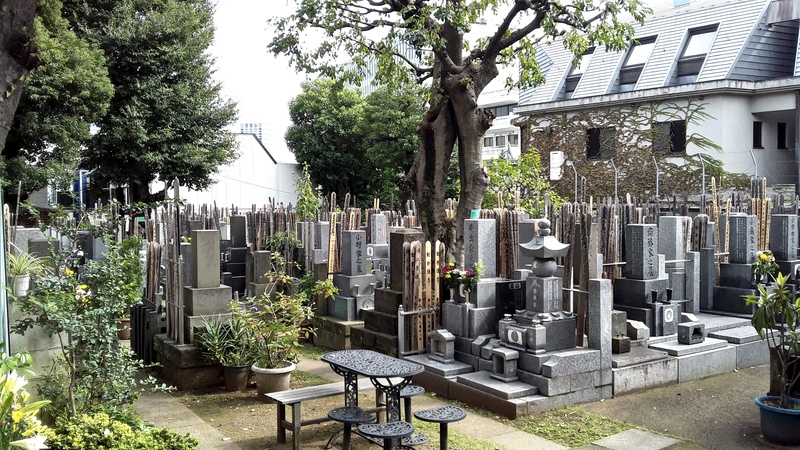 And in Japan, whenever an actor onstage, or an actress on film, takes the role of Oiwa, they go to her shrine in Tokyo and ask Oiwa’s permission to play her. And that’s what I did too. 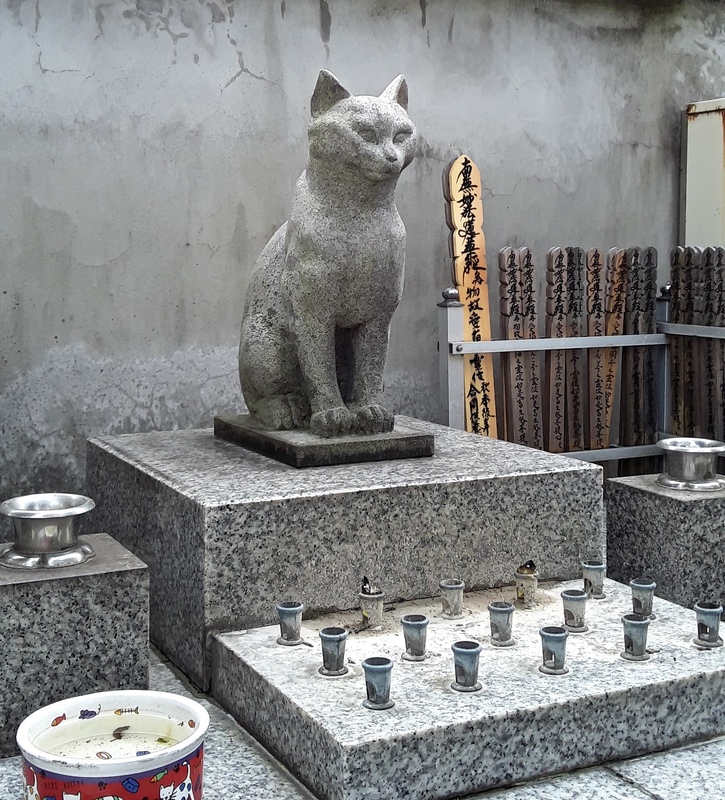 The shrine in Yotsuya, Tokyo. The trope of the Maiden Ghost, based on Oiwa, has appeared in so many incarnations now that she’s thrown the first pitch in a baseball game. Which sounds silly, but I find it actually shows that Japan takes her as seriously as kabuki; she is embedded in Japanese culture — everyone knows her, and everyone, in a strange way, loves her. She embodies something genuinely wrong — vengeance — but it’s something everyone understands and has, at some point, wanted against someone else. I’m frightened by and enthralled by her. I hope it’s not cultural appropriation — Gore Verbinski’s remade Ringu, quite well, I thought. Yes, I went to visit Tokyo to see the city, yes I met up with an old friend who’s been in Japan 14 years. 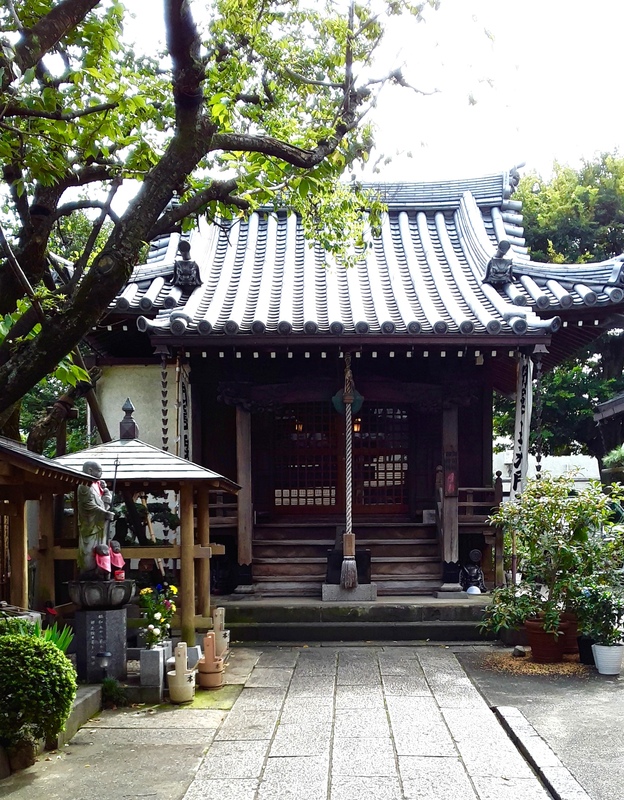 However…I also went to Tokyo specifically to visit Oiwa’s shrine and ask “is this okay?” I hope it is. A closer look at one grave.